Benefits/Advantages of Coilovers vs Springs. 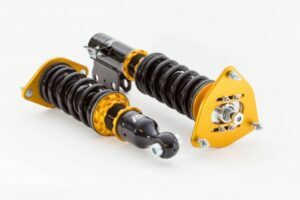 Many circles argue the pros and cons of springs vs coilovers. A lot of myths and assumptions are thrown out in the world these days in regards to the highly debated coilovers vs springs topic. In this article we will be discussing the difference between the two, as well as advantages and disadvantages for each. When it comes to lowering springs, they are the easiest way to lower your can and the most economical as well. It is important to note that each lowering spring is not the same. Many tests have been done on the same make, model, and year. Brand X that offers the same lowering capacity as brand Y, but brand X lowered the car .25 inches less than brand Y. These tests tell you that it is important to not only research the springs you are interested in, but also try and get a test drive in another enthusiasts car from a local forum/group before purchasing. Overall, lowering springs are great if you are on a tight budget, know very little about working on your car, and are looking for an easy install. The drop rates can vary greatly from brand to brand leaving you with an unexpected drop, and they are not adjustable. Once you purchase and install your springs, the only way you can adjust your car is to purchase a new set of springs. Also the springs don’t “match” your shocks which causes for increased levels of wear on your shocks. This will cause your shocks to wear out prematurely. Coilovers are more expensive than springs but they allow the user to adjust the ride height at any time. This provides the car owner the ability to adjust the ride height depending on weather conditions, what wheels/rims are on the car, etc. During the winter you can raise your coilovers to gain more clearance. This reduces the likelihood of snow and ice contacting the undercarriage causing damage. During the summer you can lower the ride height. You can also adjust the damping on many coilovers. Having damping adjustment allows you to control the ride quality; softer or harder depending on what kind of driving you are doing. Since your shocks and springs are matched and made to work with each other you will reduce the wear on the entire system. Your ride quality and handling will be smoother. You can corner weight the car, and you will have a more comfortable riding experience. You can also adjust the ride height or damping anytime. They are more expensive than lowering springs. There is some trial and error with lowering or raising the car to reach your determined ride height. To summarize, coilovers are generally the way to go. The level of damage you will cause your shocks when using lowering springs depend greatly on the quality of the stock shocks and how low you are looking to go. But, if you can afford to fork out the few hundred extra on coilovers that would be the better choice.